Patsy is our Pet of the Month for March. She is an 18-year-old cat whose owners noticed that she had discharge from her eye and was squinting her eye. They decided that she needed to be seen by a veterinarian. They brought her to Hawthorne Hills Veterinary Hospital where Patsy received a full physical exam as well as a detailed ocular exam. Patsy’s eye was painful, with inflamed conjunctiva and yellow, mucoid discharge. A special ocular stain called fluorescein stain was used in her eye. Since the cornea is clear it can be extremely difficult to tell if there are any scratches or ulcers. 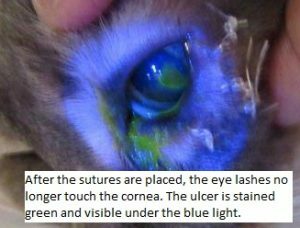 The fluorescein stain is neon yellow/green and will adhere to any break in the cornea’s surface; making scratches and ulcers visible. When Patsy’s eye was stained, a corneal ulcer was found. Corneal ulcers can happen for many reasons: trauma, infection, foreign bodies, distichiasis (eyelashes growing in an abnormal location), or secondary to decreased tear production to name a few. Most corneal ulcers are uncomplicated and will heal completely in 1-2 weeks with an antibiotic eye drop. Patsy was prescribed an antibiotic eye drop be given three times daily for 7 days. A recheck exam was scheduled for 1 week. 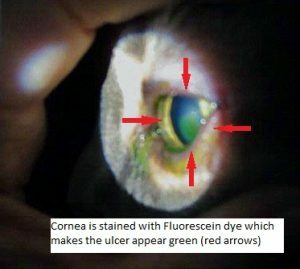 It is extremely important that corneal ulcers be rechecked by a veterinarian a week after treatment. In most cases, the ulcer is resolved or greatly improved. If at the week mark the ulcer is worse than immediate intervention is needed. If a corneal ulcer worsens, without treatment they can result in permanent damage of the eye, including blindness. 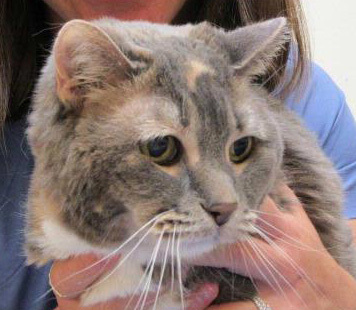 At Patsy’s one week checkup, her owners reported minimal to no improvement with her symptoms. When her eye was stained again, her ulcer had a similar appearance to the first visit. Since Patsy’s corneal ulcer was no better but hadn’t worsened, it was decided to give her another week of treatment. At Patsy’s second recheck, it was a similar story. No improvement with her clinical signs and the ulcer remained a similar size as before. It was decided to perform a test that measured tear production. This test is called a Schirmer tear test (STT). Patsy’s STT was normal, so we could rule out dry eye as preventing her ulcer from healing. After the veterinarian had finished Patsy’s exam she noticed that Patsy’s lower eyelid rolled in so that her eyelashes where touching her cornea. The eyelashes contacted exactly where the ulcer was. When eyelids roll inwards, it is a condition called entropion. 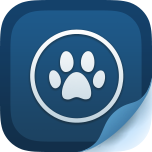 In dogs, this is a congenital condition that needs surgical correction. The surgery removes skin under the eye. When the skin is sutured together it pulls the lower lid down so it is not rolled inwards and back to a normal position. 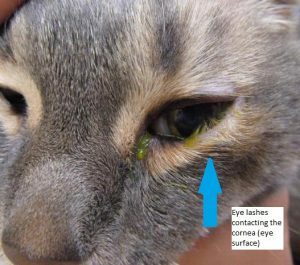 With cats, this is very uncommon; most times entropion is secondary to ocular pain. The ocular muscles spasm cause inward rolling of the eyelids. Patsy’s corneal ulcer (likely from trauma), caused pain and muscle spasms around her eye. The muscle spasms caused entropion which allowed the eyelashes to contact the cornea preventing the ulcer from healing. To correct Patsy’s entropion, a procedure was done that involved placing stay sutures in her lower eyelid. The sutures kept the eyelid in the correct position so her eyelashes did not contact her cornea. After the procedure, her owner noticed an immediate improvement. The following week Patsy’s eye was stained and the corneal ulcer was healed. The stay sutures were kept in place for 3 weeks to ensure her eyelid did not roll inwards again. Once the sutures were removed Patsy’s eyelid stayed in its normal position. While most corneal ulcers are uncomplicated and heal quickly, it is extremely important that they are rechecked. Chronic corneal ulcers can progress causing much more serious disease of the eye and they are extremely painful. Patsy’s owners did the right thing by bringing her to the veterinarian promptly and following through with her recheck exams.